Yesterday my second son told me he was bad. “What did you do?” I inquired… concerned that he had destroyed something and was feeling guilty, meaning he did something wrong. “D – #1 won’t pitch to me,” he said sadly. “Well… that certainly doesn’t make you BAD,” I comforted. Then I thought about myself. but how often do I let others make me feel like I am suddenly less than what God has created me to be? How easily do I compare the life God planned for me, with one the world tries to sell me as what I should be doing? I’m anything but perfect, but insecure – I am not. My security. My hope, and my worth… are all in God. Circumstances and people cannot change that. However, I am a sensitive person… so I’d be lying if I said I never hurt for the hearts of those who can’t understand…. or refuse to accept, reject, or ignore us. It’s easy to feel radical sometimes, in small town America. My husband and I often laugh that if we lived in a bigger area – no one would think a thing about how we live (in all aspects) are strange. Not that we’d “blend in”… but we wouldn’t be so much in the minority as we are sometimes. We are hardly radical. For us, it comes down to our personal responsibility to God. Most people would rather NOT be responsible anymore, nor take a stance on things. They want to push a button, escape, and disconnect from real relationships. They’ll choose the easy road vs. making investments and taking risks – and most would rather just be fake in order to NOT be stressed, uncomfortable or inconvenienced. They will not be slowed down. They want to take a magic pill to dissolve all of the poor food choices they continue to make. It’s NOT easy being healthy for Him. But God didn’t promise easy. Next time you feel like complaining. Click this, and count your blessings – and BE STILL. Our trials are not without purpose, we can reflect His glory in all circumstances. While I’m not a fan of the term, “pay it forward.” I do believe we have a responsibility to support an encourage other brothers and sisters in Christ in whatever way we can. We will never be GOOD enough on earth, but we should never stop trying to please our heavenly Father. On that note… we made some yummy gluten-free/dairy-free banana/PB “ice cream” together – and all was good again. 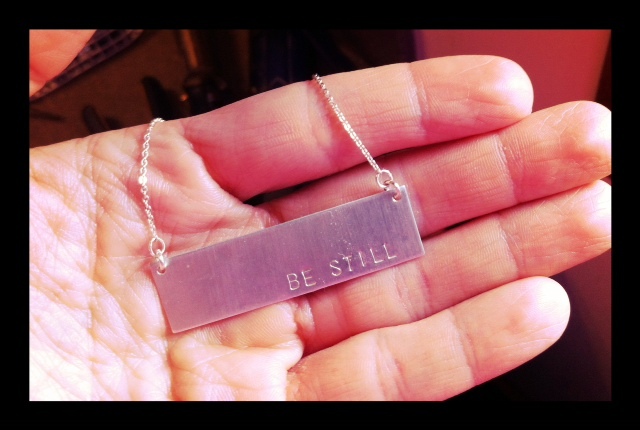 Posted on July 27, 2012, in Food To Try, Our Struggles and tagged Be Still, healthy for him, Nashelle necklace. Bookmark the permalink. 2 Comments. Mucho hugs – love you too sister!